Search Results for "golf ball in hole"
Golf Ball Is Put Into Hole And Man Reaches To Take It Out Flag Is Replaced. Golf ball rolls into a hole and bounces inside. Then, a man's hand is shown reaching out for the golf ball and taking it out of the hole. 1940s: Men, women, and children stand outside on grass, watch man putt. 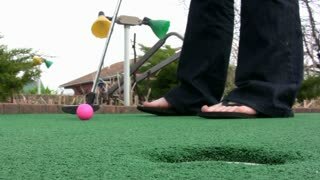 Man putts golf ball towards hole. Woman stands with arm around man. Man putts, ball goes in hole. Golf Ball Goes In Hole Close Up On Green. A close-up steady shot showing a rolling golf ball on a green grassy field that went into the hole. 1930s: Man puts golf ball into hole, crowd cheers, men walk across course. Car with flags, motorcycles parade through clapping street crowd. 1940s: Man putts golf ball toward hole. Women and men putt golf balls on lawn. 1940s: Man retrieves golf ball from hole. Costumed couples dance on stage. Costumed couples toss hats and dance. Stop motion macro of golf ball circling hole. Stop motion of golf ball circling hole. Close Up On Green Where Golf Ball Sinks In The Hole. A close-up steady shot showing a rolling golf ball on a green grassy field that went into the hole. Close Look Of Hole With Putt In And Set Up. Close up shot of a golf ball hit to hole on a green grassy field that went into the hole. A young male child putts a golf ball into a hole, then retrieves the ball from the hole. A young male child hits a golf ball toward the hole and walks toward the hole. A young male child putts a golf ball into a hole and then retrieves the ball from the hole. 1940s: Family huddles and talks on front lawn. Men putt golf balls across lawn. Golf ball rolls toward hole. Men putt golf balls. Ball rolls toward hole. A close up birds eye view of an orange mini golf ball misses the hole on a course. A close up birds eye view of a purple mini golf ball misses the hole on a course. Golf ball just misses hole. Heavy depth of field and in slow motion.